During a party in a secluded Cabin, everything changes. A human is murdered, and our friends are dragged into the war to protect our territory. More complications arise when a keeper visits Westgrove and informs us of the council’s expectations. Will we obey or go rogue? Explore Westgrove and the aftermath of the party in the pages of Talented with myself and author, Debbie Civil. 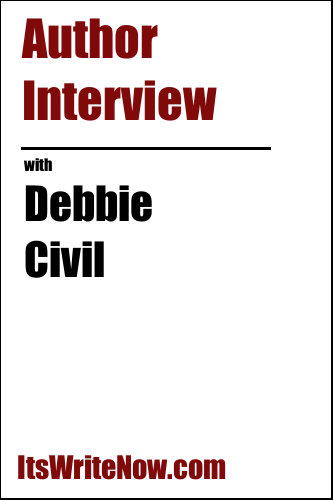 Debbie, I want to understand more about how your book came to life, what can you tell us about how this book started? This story began because of my overactive imagination. In high school, I wished that I was a superhero. Years later, I listened to Taylor Swift’s album “Speak Now,” and it made me nostalgic. So I thought, why not create supernatural beings that I could relate to? When you start writing a book like Talented, did you know how it will end, or does the end appear as you start working with the characters, in this case, a cast of supernatural beings? I definitely know how the book will end! Before I write, I plan it out in my head. I don’t necessarily know every scene that will appear in the book, but I do know the major events and the ending. Now that you know how the scenes unfolded, do you ever look back over the writing period and think about how your book might be different if you could write the novel again? I would have been more confident in my work. After writing this book, I let it sit untouched for over a year. It’s a shame that you left it as long as you did, but I hope that each new book you write the period where you work sits untouched becomes shorter and shorter because you really need to share your stories with the world! On the topic of stories, what are you working on right now? I’m working on finishing up “Passion.” It’s book three of the Love War series. With three books now completed in this series, you must love that world. If you could live in one of the worlds that you created, which one would it be? Well, I would definitely live in the Love War universe. I can’t help it. I’m a romantic and love the idea of having a soulmate! I do admit I like that idea too! And maybe, just maybe we can see similar levels of love in Talented. Debbie, thanks so much for introducing myself and the readers to your work, and I can’t wait to hear more about it soon! Excited to read the book we discussed today? Find it here on Amazon: ‘‘Talented ( ASIN: B07G8W5DJ2 )‘.